Beautiful detached villa designed to maximise the views from it's hillside location, with stunning infinity pool. 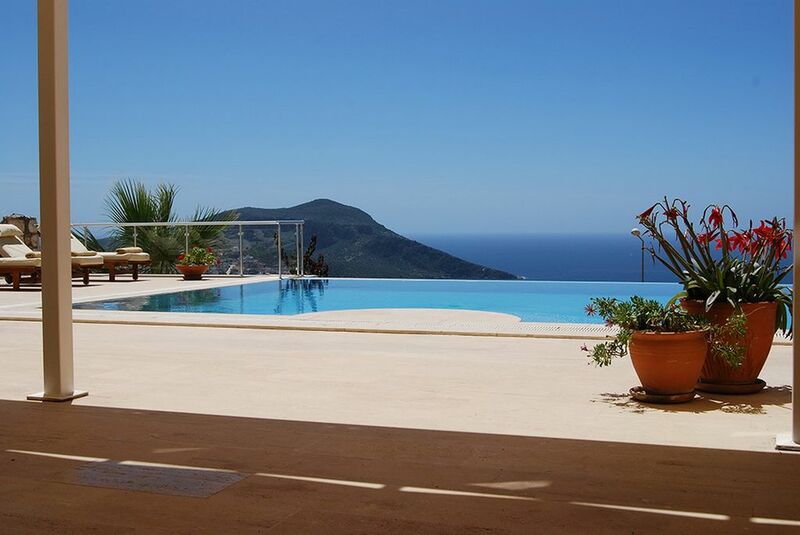 Set in private gardens with big pool area and breathtaking views over the whole of Kalkan bay from all but one bedroom. Set on high grounds in quiet surroundings, the resort centre is a 10 minute downhill walk. Please note there are a number of steps from the parking area to the villa entrance, so would not be suitable for anyone with a mobility problem. As a Turkish-Swiss couple, we live in Geneva, Switzerland, my wife is doing massage and reflexotherapy and i am a general internist medical practicioner. After many holidays traveling around Turkey, we found Kalkan the best place to settle down and we fell in love at first sight with villa Yakamoz. Stunning uninterrupted view from the infinity pool, terrace and bedrooms. Build on higher grounds, with a pool farther from street. Near enough to town centre but a more quiet environment. The villa has a light clean thoroughly, including a towel and linen change, on a weekly basis if a guest stays for two weeks or more. A drying line is located on one of the roof terraces. 'C' shaped seating unit for 10, coffee table. Ample crockery, glasses and cookware for a party of 8. Kitchen bar sitting 6, pool terrace table sitting 8. Pool terrace: A large covered pergola provides shade for outside marble table and chairs, ottoman style settees. Night-time lighting, makes for romantic pool-side dining. 7 X 5.5 m. same depth 1 m 65 throughout. Walk in steps make for easy access. The pool is serviced on a daily basis. A welcome pack with bread, butter, jam, eggs, milk, tea and sugar is expecting you for your first breakfast in the sun. The property was excellent, we had every thing we needed for our stay, we would thoroughly recommend Villa Yakamoz. Also thanks to Yusef and the team for all their help and hospitality. Im sure we'll be returning in the future . The views were outstanding and the pool and outside space was incredible. All in all we had the most amazing time and Kalkan itself is a very very special place. Thanks again for letting us stay. Having always stayed in Hotels in Kalkan before we decided to look for some larger villas that would accommodate 6-8 persons. IN Summary: Our covering title says it all. EXCELLENT VIEWS, EXTREMELY CONFORMTABLE BEDS, VERY CLEAN & TIDY. There can always be things in people's lives that they feel don't fit what they want in every way. Every hotel, accommodation etc will have something they don't like, or feel wasn't suitable for them. Yakamoz for us had a wonderful view , great pool, great beds, a terrific family villa. The men who look after the house were friendly and helpful, Hasan the taxi driver was great at picking you up and running you round. I'd say to anyone it's a perfect holiday property. The area is great, if you can't get a day out on a gules then pop to Kas, Capt Ramazan and his wife or his cousin are superb people, lovely food, nice company and look after you. Restaurants aren't easy to recommend purely on their food as taste is a hard thing to advise on , but we found Sunset, Aubergine, Gironde, Doy Doy , the Olive garden and Baharat to be great in many ways, differing from the views, the food and the service. The owners gave really helpful details , all in all a top Villa. We had a wonderful relaxing time at Villa Yakamoz which was perfect for us - very spacious and with everything we needed plus wonderful views over Kalkan bay and a beautiful pool and terrace area. Yusuf and his team looked after us and took care of our airport transfers and car hire, so it was all very stress free. This was our first visit to Turkey and Kalkan was perfect - everyone was very friendly and it's great for a wander, a cocktail and a boat trip. There are so many restaurants to choose from and we really enjoyed trying out the beach clubs. It's a particularly good place to come with teenagers and the exchange rate is very favourable so makes eating out even easier!! We'd all definitely like to go back to explore some more and we would recommend Villa Yakamoz without hesitation. Thank you so much for a very happy holiday - wish we were still there! We are just back from a magic one week stay at villa Yakamoz, everything was perfect. The villa, the cleanliness, the view and the bed. Yusuf was always disponible in case of need. We definitely recommend villa Yakamoz, you won’t be disappointed. We spend a wonderful week at villa Yakamoz, such a relaxing place with an absolutely marvelous view. Our transfer was organized by Yusuf, the man in charge, and went smoothly, on the premises Yusuf was very reactive and efficient to help us for every need we had, he organized for us a one day boat trip that we would recommend to all, a nice time on a comfortable boat, nice food and friendly people (like most Turkish persons we met in Kalkan). There is a terrace at the top of the building but we never used it because the view is the same sitting next to the pool, in the living room or from three out of four bedrooms. The villa is located in a quiet environment about 15 minutes walk to center (quite steep) but we used the taxi recommended by Yusuf, costing only 15 TL one way. The clean villa is perfectly equipped with all you need to cook for eight persons there is also a water fountain available. The beds are very comfortable allowing for a good sleep. The only (little) flaw was the air conditioning in the living room slightly noisy, but we almost never needed it, as we were spending most our time next to the pool, nicely illuminated at night. If we come back to Kalkan, we will definitively come back to villa Yakamoz, as we have observed that not so many villa available for renting in Kalkan have such an interrupted view from high grounds, many having their view from the poll partially or totally obstructed by other villas. Thank you very much for this kind review, we are always glad to hear that our guest enjoy their stay. Regarding air conditioning, we are in the process of replacing all of them with new models much more eco friendly and silent. Hope to have you in our villa again. Beautiful Kaputas beach, situated at the bottom of a ravine 10 minutes by car, whilst Patara beach, voted the best beach in world, with 18 kms of white sand is a 15 minute drive. With the absence of mass tourism, Kalkan remains a charming and unspoilt haven of lush mountain landscape and crystal clear sea. The area is rich in historic architecture and ancient history. The ancient sites of Xanthos, Letton, Pinara, Tlos and Patara are all close by. Guests should ensure that they have their own insurance cover for personal injury, loss of possessions, damage to property and cancellation.